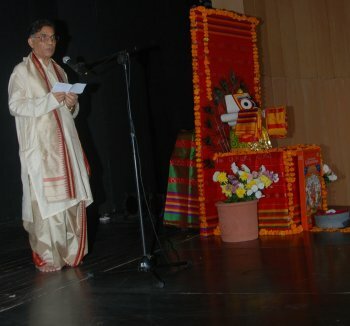 I happened to be in Delhi on personal work on 4th October 2011 and by a happy coincidence the Ashtapadi Festival (hosted by Vidwan Dr. Subas Pani, who is the author, translator, and scholar with special research interests in Lord Jagannath, Jayadeva and Geetagovinda) was underway at Kamani Auditorium. Such coincidences come only occasionally in one’s life, and when they do, they invariably present an opportunity to not only enjoy an Odissi recital but also to assess what is happening in the dance ‘scene’ beyond the shores of Odisha - and that too in the nation’s capital city which presents a large and wholesome bouquet of classical recitals. Thus I was only too happy to seize the chance and I was duly welcomed by Sri Subas Pani who has rich experience in Odissi dance and music. The first evening of the Ashtapadi Festival had an offering of seven songs from the Geetagovinda performed by Aruna Mohanty, Sharmila Biswas and their groups. The second evening was of special interest for me since Aruna Mohanty’s students danced to the compositions choreographed by Sharmila Biswas. It is always encouraging when such creative collaborations are attempted; one can always expect the best elements of both senior artistes would be manifested in a joint labour of love. This factor was amply in evidence in the second (the song ‘Anilatarala’) of the seven presentations on view of the second evening performed by Janhabi and Arupa. 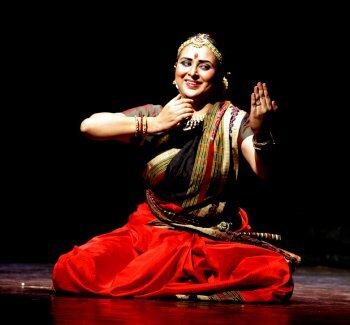 The third song ‘Manjutarakunjatala’ of the evening struck me most as an excellent choreographic endeavour by Sharmila who has always been noted for her diligent, fresh and startlingly innovative compositions that never fails to hold the attention of anyone who is always in the lookout for fresh and provocative ideas. Sharmila, in this department has always shown to have a fertile brain and this composition, neatly executed by Saswati and Piyali, demonstrated an excellent choreograph. I am happy to state that Aruna Mohanty brought in her substantial experience and efficiency in delineating the song ‘Ramate yamunapulina vane’; this was nice, and the Delhi audience was generous in its applause for one of Odissi’s senior most dancers. It was evident that much thought and preparation has gone into creating this composition, and in the result, was certainly pleasing. A word about the music accompaniment. Just about adequate. And in certain places the music could have been of a little higher inspirational level that one expects from the stature of the musicians and singers who are themselves, established names in Odissi accompaniment. I found myself wishing that the music would jell more easily and more compatibly with the dance and I could not help noticing that the pitch fixed for one of the lady singers produced an unwelcome shrillness in the upper registers while one of the male voices seemed to be suffering from strain and occasional lack of note perfection. All in all a good, hard-working effort by Dr. Subas Pani and his colleagues of the Geetgovinda Pratisthana who are pleasingly committed to project Jayadeva’s immortal poem - the Geetgovinda.